Looking to streamline processes across development, test, and operations teams with more efficient Test Data Management (TDM)? Don't let antiquated technology and complex processes stand in the way of fast access to high-quality test data. Next-generation TDM transforms how businesses deploy testing environments and the way teams work within them, providing both greater flexibility and increased efficiency. How to determine the right number of nonproduction environments needed for application testing. Why businesses are moving beyond legacy TDM solutions. 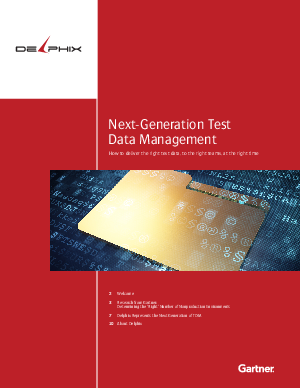 Key capabilities that next-generation TDM solutions offer to development and testing teams.